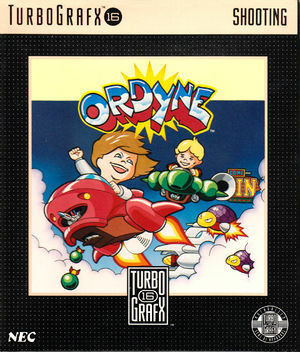 Ordyne (オーダイン) is a horizontal scrolling shooter arcade game. It is officially described by Namco as a "comical action shooter". While blasting enemies, Yūichirō and Sunday can pick up crystals that can be used to buy special weapons, extra lives, etc. Miyuki-chan's shop passes by at certain points in each level. When Dream Co., Ltd. passes by, Yūichirō and Sunday can win a load of crystals or a special weapon by shooting at his rotating target. The standard shoot-em-up rules apply. Advance through a scrolling level and then meet up with a big boss, indicated by a change in music. One hit will kill Yūichirō and Sunday, but they can either earn or buy extra lives. This game also features voice samples (in Japanese). The graph below charts the compatibility with Ordyne since Dolphin's 2.0 release, listing revisions only where a compatibility change occurred. This page was last edited on 6 January 2018, at 10:49.